HOMG it's late here and I've been working all day on this! I am sleeeeeeping after this! I HAVE DECIDED TO SELL ALL MY MERCH EXCEPT FOR MY MAIN COLLECTIONS! Some rare, old merch you'll have a hard time finding anywhere else! This is my last downsizing for awhile! My next post will be later this summer to sell/trade my 9,000 spare cards! You won't find many cards in this sales update but there are some! Don't let the name of my shop fool you! I have TONS of regular merchandise waiting for a new home! Please click the banner to be transported! I AM OFF TO BED SO I WILL RESPOND FIRST THING IN THE MORNING! ♥! I need your help badly please! I'm in a bad situation, as something unexpected happened with a plushie I sold. 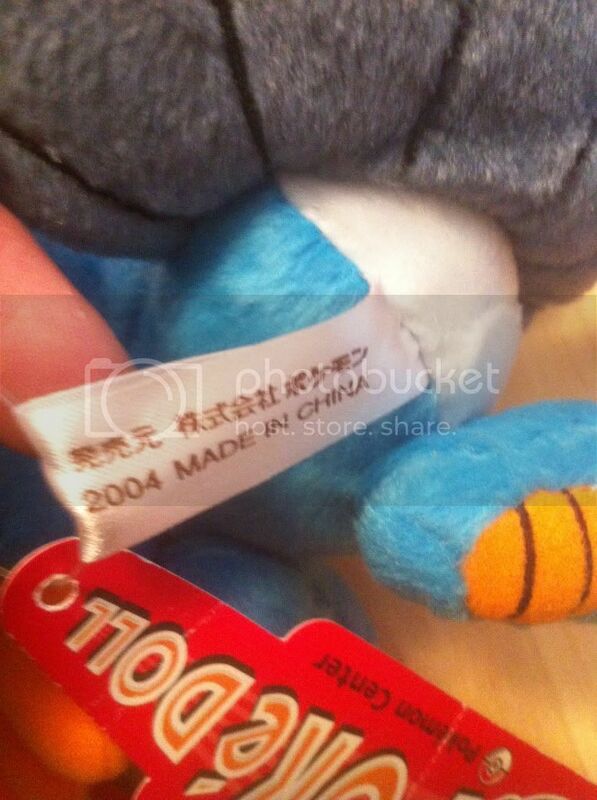 As some people told me before, there is no register of bootleg dolls ever made of swampert pokedoll, so I don't know if this could be a factory mistake? does anybody know if nintendo/Pokemon retagged these dolls to sell in America back in the day? I heard miss_fuu_chan has an extensive pokedoll collection. Can you please shed some light on this please? anybody? Can you please help kingwillko and I to solve this mistery? I've been on an Arcanine and Growlithe card collecting spree because, let's face it, for these particular Pokemon, collecting the cards is less expensive than other merchandise. XD I had this really nice neat little Bulbasaur folio but I found another binder featuring Arcanine that's a bit larger than the one I have now, so I figured I would expand a bit! I just wrote a whole big post with a few paragraphs and heaps of pictures then i go and press that stupid button on my mouse that makes the page go back :( Waste of over an hour..
Ok. Take 2! sorry if it isnt too good. Warning, my dad got a new camera so i let him take some pictures of my pokemon gear so this post will be really image heavy! This is where i put my wants last time but i'll chuck them up later.. its 4:25 am already and im just about asleep.. Sales and Custom Stamp Slots! Any help or reference is greatly appreciated. Thirdly, I found my talking squirtle want on ebay...but...something strange is going on here. I found it in a lot of 4 for $94, which is about $24 each. Then I found it in another lot for 4 for $38, $12 each. The two lots were by the exact same seller, had the exact same Pokemon, they were all new/mint in box, and shipping on both lots is $9. One is drastically cheaper than the other and for the life of me I can't find the difference between the 2 auctions. I want to post the links here so you all can see for yourself and maybe point out the difference to me, but I know we're not supposed to do that. There's no way I'm paying $94 for that lot of 4, but I would pay $38 so I'm really confused on what's going on there lolz. Just a little reminder of my quick sales post I made a few days back! I'm trying to get rid of these stamps and a Jakks Pidove figure. I also have some Korean stickers and erasers along with TCG cards and some other misc stuff in my normal sales post. And finally, I have a quick question about posting pictures here on LJ... Does anyone else have trouble with them disappearing sometimes? I usually upload to the scrapbook, but even for my photobucket images I have this happen. Usually a hard refresh gets them back, but I wonder if others can't see my pics either? I'm using the latest FireFox on Windows 7 if that helps any. Just a reminder that the auction for my mint condition Articuno Zukan ends tomorrow at 10pm GMT. It's still at a rather low price! You can find it over on my post HERE! Hey guys! So I went to a yard sale this Saturday and got my hands on a huge box of old Nindeno Power Magazines! Check them out! Some of them had some super cool Pokemon covers. Most were advertising the release of Gold and Silver for Gameboy Color back in 2000. All of them still had the posters in them. Some tiny plush which preferably cost no more than around $25, so, something small! COLLECTION UPDATE, IDENTIFICATION AND UPDATED SALES! 2.) If no one here is selling them, what are the reviews on sites like Pokevault.com? My friends are badgering me telling me to order from there, but their prices get pretty ridiculous and I wanna make sure they're community approved before I spend the extra cash. Sunyshore and the community are my go-to places for Pokemon stuff, so anything outside I get wary of! Hi there! My name is Javier AKA HJGF I'm from Guatemala and well as you know I'm a fan of pokemon and when I saw this site I was like :O Anyways I just came to say hi to you guys and to congratulate you for the awesome collection of many of you guys! I'll be also buying some stuff here since I don't have to many pokemon stores right here he he. These guys, they both have an ugly envelope but they are still in good condition tho, they were like a buck I guess it wasn't such a big deal but it's nice for my collection. Anyways greetings to all you guys! Good luck collecting. I'm on a roll, guys! I got the PlayByPlay Eevee yesterday, and now some plush toys from Jakks! I'd also like to thank everyone in this community for supporting my habit...now I have no more money left. Haha. ;) I've also got some questions about bringing an old plush back to life. Going to post a card want list again 'cause it was helpful to my collection last time I posted. ^^ The list is mostly the same but I've made a few revisions. XD! I'm looking to trade for the following cards (hopefully in English though will probably consider other languages). Please let me know if you have any of these in M/NM condition for trade. And, if you have a wants list that would be helpful. I only really have cards to trade (Topps or TCG). I also have a few old school tomys and a new Jakks Snivy Figure. And...I think that's about it. Just a warning, I don't have many Rarer than Holo Rare cards anymore but I'm willing to trade multiple cards to make up price differences. Before I get to the actual cards, I'm working on making a list of English booster wrappers I need. Would anyone be interested in a possible booster wrapper trade? I'd also be willing to trade un/common cards for wrappers. I'd be looking for ones where the front of the wrapper is in mint condition. I'd also be interested in getting foreign language wrappers. I have a few Korean and Japanese ones already. Also, besides looking for the cards below in English (except for the 3 that are only available in Japanese), I am looking for foreign language cards (especially if not Japanese) of any canine, feline, rodent, mew, victini, and gastly line....and others but those are the main ones. Note: Images borrowed from bulbapedia. If the cards are in a Japanese or 1st edition...ignore that. Just using these for a ref for the image on the card. Looking for the multi-colored one...not the pink coin. Looking for this Milotic tin. Can be empty with no cards inside. Last Southern Island postcard I need. I'm also looking for any Unown H. I think that's the only letter I'm missing now. Also feel free to show me your Eeveelution, Poochyena line, Growlithe line, Meowth line, and Gastly line cards that are available for trade. I need too many of those to list. Though, I'm only missing a handful of Eevees...maybe only one or two. Replies might be slow since I'm working on final projects for my classes. Warning: I won't be able to ship my half of the trade until April 30th at the earliest. But I'm posting this ahead of time so we can get trades finalized in the mean time. Please also don't forget to check out the rare items I have up for offer/auction. Includes a shiny pokedoll! Hey hey, my name is Zac and this is my first step towards actually becoming a full member of this site. Back about a year ago now, I sold kanto and johto badges to a lot of people from this site and was pretty much blown away by the caliber of buyers. It was a massive blow to lose selling privileges, but it was also completely deserved after the complications that arose with the shipping for the johto run (lot of personal stuff came together at a bad time). So yeah, just expect to see me or my bud Jon posting here every now and then! I'm looking forward to it! So far I have had no bids on the charizard so I lowered the price because I need him to go to a nice home. Also my dear community members I was wondering if anyone could help me out on this topic. Me and my uncle are trying to start a pokemon store here in Texas but so far the whole seller we buy are items from usually have old or not very popular items up for grabs and no plushs. I was wondering if anyone knows some good whole seller sites or places. It this isn't allowed I will gladly take it down, I just would really like to see a pokemon store here where I live. And of course I'll keep up my tradition to post memes! Let me think of one quickly... Uhm... What kind of trainer class would suit you the best? For myself, I guess either Lass or Picknicker would be kinda fitting. Yes I know, wrong gender and stuff buuuut I love cute things and can be kinda bratty at times, and for Picknicker, well I really enjoy being outside somewhere natury :3 And picknicks rock! It's that time of week again! (And I didn't forget this time!!!) 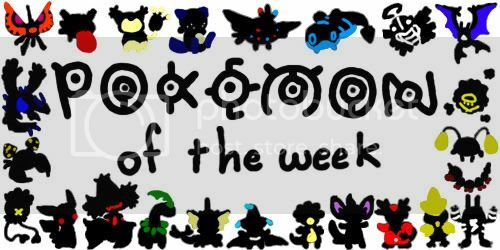 Pokemon of the Week! Cross your fingers for your favorites and let's roll that randomizer!